A drizzly Thursday night needs a couple of things to call it a success. A decent gig in a nice venue, some great acts you can listen to (even dance to) and a pint. A glorious, cold, beautiful pint. Getintothis are weary travellers, we’ve been to gigs everywhere from Aberdeen to Warsaw, with stops in Dublin, London, Paris and Toronto and fields all over. The one thing that pulls those tales together is the ability to stand at the back, scratch our beards and discuss the talent while holding a pint. Or two. No such luck here, partly because most of the taps were off and the glasses too small. Please, can someone rectify this? If we start an online pint petition can you all sign it? Liquid refreshment gripes aside it has to be said that we’re big fans of the Buyers Club and tonight is a journey into something a little different. David O’Dowda is a new one on us, hailing from Manchester he props himself behind a piano in what is still a fairly quiet room. He pairs a piano with an array of click tracks, blips and beeps to open proceedings. He throws in feedback, echo and other strange unidentifiable noises. He straddles a line that we couldn’t quite place. It’s obvious he pores over every note, as an opener, it was more than enough to draw us in and send us off to SoundCloud, a starter for ten? Throwing caution to the wind Vidar Norheim comes on stage after O’Dowda. Tonight sees the launch of his new EP, Blind Carbon Copy. Vidar delivers it with an intensity that gives us a view of the energy and love that has gone into the record. 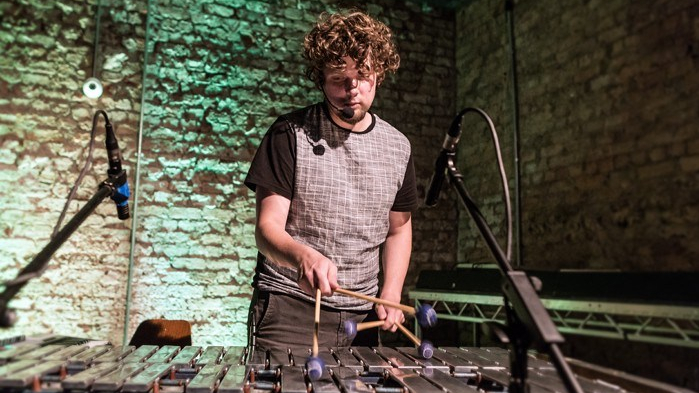 It’s rare to see a vibraphone on stage, rarer still to see one connected to a Mac. It’s also rare to see a microphone used as an instrument, throw in some technological know-how, some synth and an assortment of tics and tacks (digital and on the instruments frame) and Vidar is an intriguing prospect. With a voice verging on autobiographical lyrics, a couple of instrumentals and some sounds that wouldn’t be out of place on the soundtrack Run Lola Run (not to mention the China Crisis track) and it all pulls his sound together in an ethereal Nordic way. A highlight is when Vidar brings his wife (and masterful door manager) on stage for some piano accompaniment on Two Revolutionaries. It adds another little layer, another sound, another twist. Beautiful stuff. His set ends with what sounds like the product of a twisted night where Grand Master Flash and the Hot 8 Brass Band have got drunk and gone mad in the studio. Vidar said he was a little nervous about attempting it, he shouldn’t have been, it was sublime. Having exited stage left we were left with waiting on Lo-Five, the second support act of the night to draw things to a close. The difficulty with coming on after the main act is that some of your punters will have likely gone home. Parents, close friends and the like will come to see the main attraction and split, yeah it gives the main draw of the night a chance to throw back and have a (glass of) beer but it throws the room off balance. Lo-Five is a laptop artiste, DJ and maker of deep bass riddled sounds that deliver just enough of a thump in the gut. He plies his trade well but we’re not convinced tonight or we wonder if his place on the bill was quite right. It screams Kaz Garden on a chilled Sunny Sunday and this was not that, can we get him a garden and some sun? All in all, this was perfect Thursday night material, some acts to look out for, a promoter to watch and a night to mull over. Cover Image by Tom Adams.